Fig. 1. "Washington's Residence, High Street." Lithograph by William L. Beton. From John Fanning Watson's Annals of Philadelphia (Philadelphia, 1830), PL. facing p.361. Library Company of Philadelphia. Some copies of the 1830 edition of the Annals have the other Breton lithograph of the President's House. For more than 150 years, there has been confusion about the President's House in Philadelphia (fig. 1), the building that served as the Executive Mansion of the United States from 1790 to 1800 — the "White House" of George Washington and John Adams. In July 1790 Congress named Philadelphia the temporary national capital for a ten-year period while the new Federal City (now Washington, D. C.) was under construction, and one of the finest houses in Philadelphia was selected for President Washington's residence and office. Prior to its tenure as the President's House, the building had housed other such famous (or infamous) residents as Proprietary Governor Richard Penn, British General Sir William Howe, American General Benedict Arnold, French Consul John Holker, and financier Robert Morris. Historians have long recognized the importance of the house, and many have attempted to tell its story, but most have gotten the facts wrong about how the building looked when Washington and Adams lived there, and even about where it stood. Beginning around 1850 — fifty years after Washington's death — a dispute arose over the size, the exact location, and the appearance of the building during his presidency. Most of the house had been demolished in the 1830s, and since there seemed to be little physical evidence of it remaining, the disagreement boiled down to the conflicting boyhood memories of two antiquarians: John Fanning Watson and Charles A. Poulson. Each man was well-intentioned, and following what he thought was the truth, but their visions of the house seemed irreconcilable and neither proved his case definitively. Both men had adherents who carried on the debate after their deaths, and the controversy continued without a final resolution for more than a century. In the 1930s, a team under the Works Progress Administration spent close to two years researching the house and constructing an elaborate scale model of it, 1 but their work was based upon a theory that has proven to be specious. The long controversy caused considerable confusion — fiction almost triumphed over fact — and a trail of misinformation about the house developed that has continued to this day. The ultimate casualty of the confusion was the building itself, portions of which survived into the middle of the twentieth century, only to be demolished because they were not recognized for what they were. The purpose of this article is to correct the century-and-a-half of misinformation, to put an end to the confusion, and to present an accurate and documented portrait of the President's House. 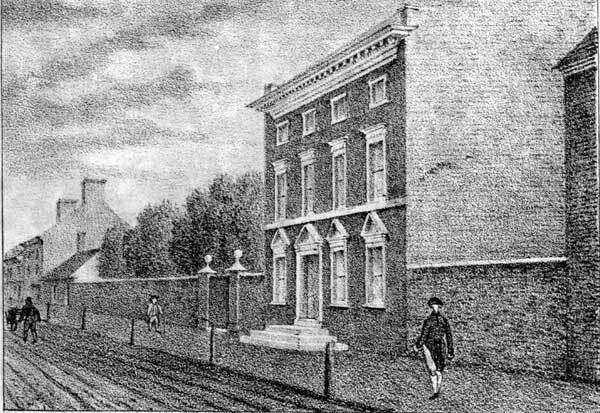 The house has been given many names: The Masters-Penn House4 (after its first two owners), 190 High Street5 (its first eighteenth-century address), the Robert Morris House6 (one of at least seven Philadelphia houses associated with him), the Washington Mansion7 (which gives short shrift to Adams who lived there as president for more than three years), the Executive Mansion, the Presidential Mansion, and multiple variations on the latter two. The name most often used by eighteenth-century newspapers, diarists, and letter-writers — and the name used by Washington and Adams in their formal correspondence — was "President's House." Later, this was the name given to what we now know as the White House in Washington, D. C., but that should not cause confusion. Fig.2. "The House intended for the President of the United States, in Ninth Street, Philadelphia." Both Presidents Washington and Adams declined to occupy this mansion. Engraving by William Russell Birch and Thomas Birch. From The City of Philadelphia...As It Appeared in the Year 1800 (Philadelphia, 1799), pl. 13. The house the presidents did occupy — Washington from 1790 to 1797, and Adams from 1797 to 1800 — was one of the two or three largest private residences in the City10. Although their contemporaries may have used the name "President's House" interchangeably for both the house and the never-occupied mansion,11 throughout this article it will refer only to the Market (or High) Street house in which Washington and Adams actually lived and worked. The survey states that the main house was 45 feet wide and 52 feet deep, with the standard 14-inch exterior walls and 9-inch interior walls.21 On the facade of the first story was a frontispiece or decorative architectural frame surrounding the front door that, along with the three windows, bore pediments, or triangular tops. There was a cornice molding at the roof decorated with modillions, a series of ornamental brackets. The roof was covered with wooden shingles, probably cedar, which were laid in tight (short) courses. The house was, in essence, two adjacent rowhouses. On the first story, the western half contained two large rooms or parlors; the eastern half had the entry, stair hall, and a smaller parlor. The brick wall down the center of the house may have risen all the way to the peak of the roof to help support the ridgepole (the top beam), and it could have functioned as a partial fire wall between the two halves. By 1775 the political climate of the colonies was changing, and some sort of conflict with the mother country seemed inevitable. Richard Penn decided to return to England with his wife, mother-in-law and sister-in-law. Before he left, he put his Pennsylvania affairs in the hands of his agent, Tench Francis. In the late summer of 1777, General Sir William Howe, commander-in-chief of British forces in America, sailed his fleet south from New York City into the Chesapeake Bay, landed in Maryland, then advanced his troops toward Philadelphia. General Washington and the Continental army attacked the British at Brandywine Creek on September 11, but were repulsed. After some skirmishes and a feint to the north, Howe marched into Philadelphia unopposed fifteen days later. Washington made a surprise attack at Germantown (just north of the city) in early October, but this opportunity for a patriot victory turned into a humiliating defeat. It was to be the last major action near Philadelphia until the spring. Washington withdrew to Valley Forge, some twenty miles outside the city. General Howe moved into Richard Penn's house, and made it both his residence and headquarters. Having captured the de facto capital of the colonies and occupied it with more than ten thousand troops, Howe sat back and waited for the rebellion to fall apart. With little to do, many of the British soldiers passed the time by playing cards and with cockfights and horse races. Some put on plays and concerts and gave balls for the young ladies of the city. The general became the darling of Philadelphia's Loyalists, and the house the center for "high life." The social whirl reached its peak in May 1778 with the Meschianza, an enormously elaborate (and expensive) day-and-night spectacle organized by Howe's officers, and held at one of the suburban villas. By this time, the General had been recalled to England, and this regatta, medieval pageant, casino, ball and banquet, topped off with fireworks, was a send-off not to be forgotten. But the rebellion had not fallen apart. Howe was replaced by Major General Sir Henry Clinton, a no-nonsense officer, who probably lived in Richard Penn's house for only a month. Clinton had been given instructions from London that the army should abandon Philadelphia and return to New York City. A twelve-mile-long line of troops and civilians (including more than three thousands Loyalists) made the slow journey across New Jersey to New York. The last of the British soldiers crossed the Delaware River on June 18. Philadelphia was reclaimed by the American patriot forces and Richard Penn's house became the residence of the new military governor of the region. A popular but false legend claims that Howe's bed was still warm when taken over by the house's next resident — another lover of high life and arguably the fiercest warrior of the Revolutionary War — Benedict Arnold. Arnold entered Philadelphia on June 19, 1778 and immediately declared martial law. There is a good deal of confusion about when he moved into Richard Penn's house. Based upon misreadings of nineteenth-century sources, some twentieth-century authors have erroneously claimed that Arnold made his temporary (or permanent) headquarters at the Slate Roof House, the Governor John Penn House (next to the Powel House), and the General John Cadwalader House. The most reliable first-person account of the reentry of the patriot forces into the city is in a letter found in Watson's notes for his Annals of Philadelphia. Deborah Logan states that Arnold initially made his headquarters in the house of Henry Gurney, a retired British Army officer.23 (Gurney's house was on the north side of Chestnut Street between 4th and 5th — opposite what is now the Second Bank; it was later numbered 153 Chestnut. )24 According to Logan, within a week of Arnold's arrival in Philadelphia he had moved from Gurney's house into Richard Penn's house. General Arnold lived grandly in the Market Street house with his military staff of ten, hiring at least seven servants, and keeping a chariot and four horses. The French ambassador, M. Conrad Alexandre Gérard, arrived in Philadelphia the second week in July, and he and his suite temporarily lodged at the house as Arnold's guests. On July 12, a reception was held there to welcome the new ambassador, which the wife of the Loyalist Joseph Galloway noted in her diary.25 Galloway had bought Alexander Stedman's house, next door to Mrs. Masters, in 1770. Mrs. Galloway remained in Philadelphia after the British evacuation in the vain hope that she could protect the property from confiscation by the Supreme Executive Council of Pennsylvania. Arnold resigned as military governor on March 19, 1779. That month, he bought a villa outside the City, the heavily-mortgaged and already-tenanted Mount Pleasant, to give to his bride, Peggy Shippen, as a wedding gift. The two were married on April 8, but they lived together in Richard Penn's house for only a couple of months. In May, Arnold began his treasonous correspondence with the British. All told, Arnold occupied the house for just over a year. By September 1779, he and his wife had moved to a less expensive house owned by her father.26 The following summer, Arnold requested the post of commander of the fort at West Point in New York, with the secret intention of surrendering it to the British. Washington agreed to his request, with results familiar enough not to need recounting. The next tenant on Market Street was the French Consul John Holker. A merchant and the French-raised son of a British exile, Holker had worked with Benjamin Franklin, secretly providing supplies and money to the Continental army before France officially entered the war. Holker made an enormous amount of money profiteering, and, when later forced to choose between his private business dealings and his official post, chose business. Holker was living in Richard Penn's house when it caught fire on the morning of January 2, 1780. The 1785 deed states that the 1781 indenture tripartaite was drawn up in response to a sales contract between Morris and Tench Francis. This contract has not been found, but in order for it (or news of it) to have reached England by June 8, 1781 it must have been signed in America no later than April 1781. Had the indenture tripartaite been satisfactory to Morris, it would have become the basis for the new deed, and December 21, 1781, might have been his settlement date on the house. In the more than six months between the time when the indenture was signed in England and when it was registered in Philadelphia, the Seige of Yorktown had taken place and General Cornwallis had surrendered. It is likely that it was during this same period, perhaps beginning as soon as the sales contract was signed, that Morris had the house rebuilt. may be known of JAMES, PHILIP, or THOMAS KINSEY. Morris's possession of the Masters-Penn property in August 1781 can also be confirmed through tax records. In November 1780, the property was listed under Tench Francis's name as Richard Penn's estate, which was taxed £330 on a valuation of £120,000.40 In August 1781, it was Morris who was taxed at this location for £40/5/0 on a valuation of £350041. This valuation is quite close to the £3750 that Morris offered (and eventually paid) for the fire-damaged house. The following year, Morris was again taxed at this location for £31 on an assessed valuation of £600042. This dramatic increase in valuation over one year may reflect both the rebuilding of the house and the addition of 520-22 Market Street to the property. Grieve's mention of an icehouse and his observation that Morris was in possession of the property are confirmed by a contemporaneous entry in Hiltzheimer's diary (italics added): "Feb 12. — Loaned Robert Erwin a wagon and two horses to assist in bringing ice from the Schuylkill [River] to the ice-house of Robert Morris in the rear of his house on Market Street. "45 Construction of the icehouse was therefore complete in February 1782 and occupancy of the residence had either begun (as Grieve states) or was imminent (the Morrises stocking the icehouse in midwinter in anticipation of soon moving into the rebuilt house). Two months later, Morris made arrangements to move his office more than seven blocks (about half a mile), from Front Street, south of Dock — next door to his old house — to the northwest corner of 5th and Market Streets — less than 400 feet from his new house.46 None of this pinpoints exactly when the Morrises moved in, but it does overturn the twentieth-century conventional wisdom that Morris didn't rebuild and occupy the Richard Penn house until 1785 or later. Fig. 3.. "Richd Penn's Burnt House Lott — Philadelphia." This groundplan seems to show the property as it was in 1781 when Robert Morris contracted to buy it, although he did not obtain full title ot the property until 1785. North is toward the bottom. Unknown draftsman, ca. 1785. RG-17 Land Office Map Collection, Pennsylvania State Archives. 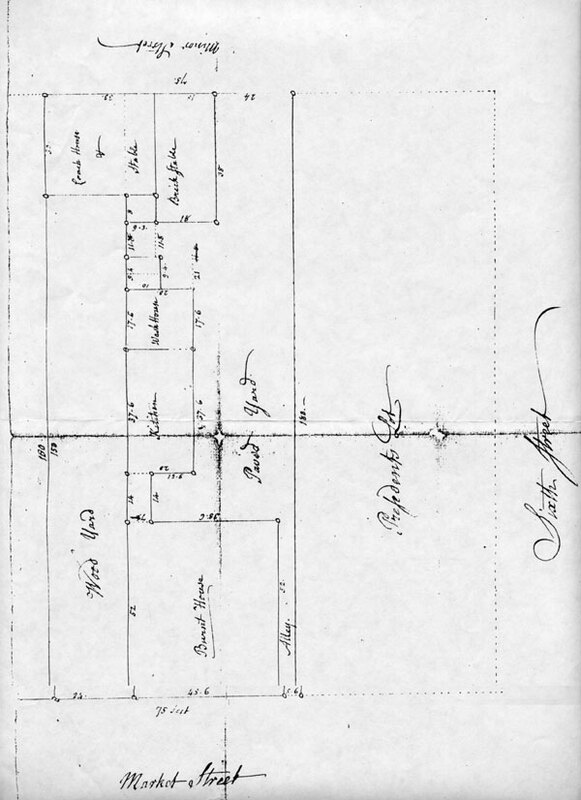 The August 1785 Penn-Morris deed included a groundplan of the property (fig. 3),47 which is consistent with both the 1773 insurance survey and later descriptions of the house from the 1790s during Washington's presidency. The groundplan shows a "Burnt House" attached by a piazza to a backbuilding containing a "Kitchen" and "Wash House." Attached to the south wall of the wash house is the smokehouse. Less than a dozen feet south of this is the cow house, which is attached to a "Brick Stable," and a "Coach House & Stable" (of wood?) on "Minor Street. "48 To the east (left) of the house is the walled lot (524 Market Street), labeled "Wood Yard," which was used for storing firewood, and making deliveries to the kitchen. The almost-half-acre walled garden (514-22 Market Street) is not shown on the groundplan, but it was adjacent to the wood yard on the east. To the south of the main house is a "Paved Yard" that was used for outdoor entertaining. The Stedman-Galloway property to the west (right) was indeed seized from Mrs. Galloway in 1778, and it became the residence of the president of the Supreme Executive Council — the equivalent of the governor of Pennsylvania (hence the label "Presidents Lot.") Morris bought the Stedman-Galloway House in 1786,49 and seems to have made a common back yard for the two properties,50 although until this purchase there probably had been a fence or wall between them. It is likely that this groundplan actually shows the property as it had looked in 1781 when Morris took possession of it, since the icehouse and other additions he is known to have made do not appear on the plan. The groundplan also does not show the hothouses recorded by Grieve, perhaps since the logical site for them would have been in the walled garden. A second story was added to the backbuilding some time after 1773, probably by Morris at the same time he rebuilt the main house. He built a two-story addition to the east side of the backbuilding, a bath house — perhaps the first in Philadelphia — that included a bathingroom on each story. The presidential entourage had arrived in the city several days earlier, and was about to depart for Mount Vernon. It is likely that Morris and Washington spent some of that time going over the house, planning the alterations and additions that would be necessary to convert it into the President's House. Washington was credited as the author of the changes to the building, and although this may have been flattery, he is known to have had a keen interest in and talent for architecture, as demonstrated at Mount Vernon. 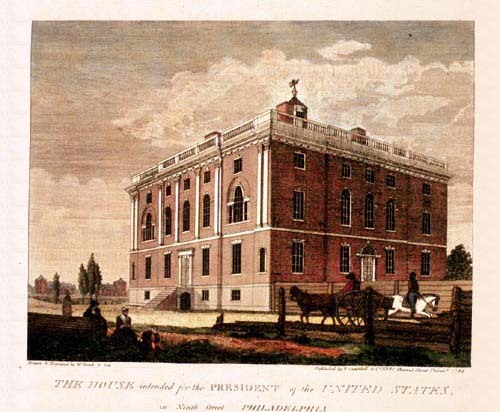 The city initially leased Morris's house for two years, during which time a grand mansion for the President was to be constructed (ultimately built on 9th Street), as part of the overall scheme to keep the national capital in Philadelphia. Morris assembled a crew of workmen "to complete the Additions & Alterations pointed out by the President" to the Market Street house, along with any changes to the Stedman-Galloway House made necessary by the Morrises' removal there. This was a "sweetheart" deal for Morris — the city advancing him the money to pay for the alterations to both houses, plus other expenses, with the total to be deducted from the future rent to be paid on his former residence.52 Fortunately for posterity, there were problems with the additions and alterations to the President's House, and a couple of changes in plan, all documented by Tobias Lear in a series of twice-weekly letters written to Washington at Mount Vernon between September and November 1790. If the 1773 insurance survey is exact in its description, each of the rooms in the western half of the first two stories was just over 24 feet in length (about 24½ feet north-south from brick wall to brick wall, minus the thickness of the interior plastering or paneling).56 The width of the rooms in the western half of the house was just over 21 feet.57 According to Tobias Lear: "When the Bow Window is run up it will make the large dining room and the drawing room over it thirty-four feet long. "58 Assuming that Lear was correct, and that the bow truly was semi-circular, this would mean that Washington's bow was about 19 feet in diameter on its interior, adding about 9½ feet to the length of the rear rooms of the first and second stories at their centers. In October 1790, Tobias Lear oversaw the moving of the furniture from New York, and directed its installation67 in Philadelphia. He was a meticulous and highly-efficient secretary, and his twice-weekly letters to Washington are filled with progress reports on the alterations to Morris's house, suggestions about where to place furniture and house people, and confirmations that the President's instructions were being carried out. Fig. 4. Conjectural floorplan of the President's House in Philadelphia — first floor. The two-story bow on the south side of the main house, the servants' hall and the slave quarters were all added by George Washington in 1790. North is toward the bottom. ©2001-2005 Edward Lawler, Jr. All rights reserved. The 1773 insurance survey describes the "Entrey" as having four arches, two fluted columns and four pilasters. Several floor plans for houses with a similar entrance hall and passage can be found in a 1757 English pattern book.70 The American house whose entrance passage and hall probably most resembles that of the President's House is "Widehall" (1769) in Chestertown, Maryland (fig. 5). The specific architectural details may have been slightly different, but the Chestertown house gives a good idea of the elegant and dramatic effect of walking through the front door into the arcaded passage of the Philadelphia house. Fig. 5. Hall and passage of "Widehall" (ca. 1769) in Chestertown, Maryland. Photo by Albert Kruse, April 24, 1934. Historic American Building Survey, no. MD-550. 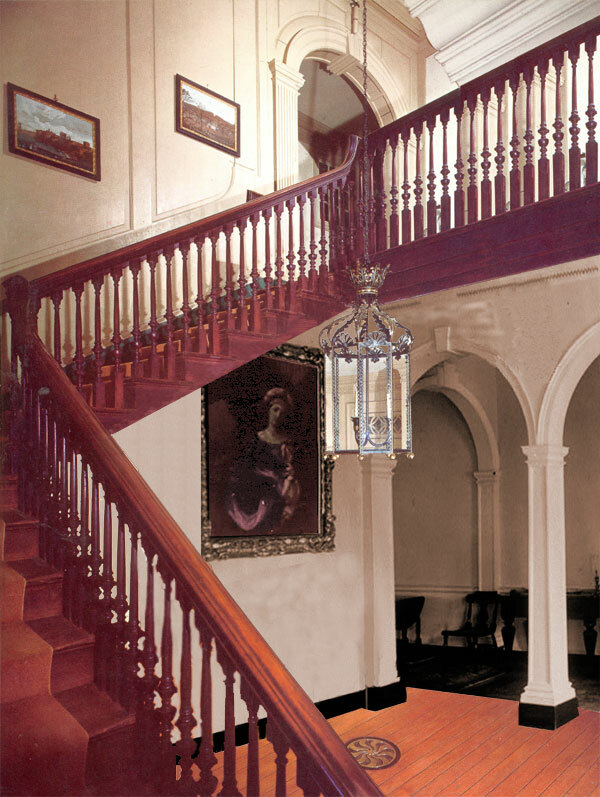 A flight of stairs rising southward along the east wall from the first story to a landing, and a half-flight running perpendicular from the landing to the second story is the solution that is most consistent with the descriptions of Washington, Thomas Twining, and others.72 A mahogany balustrade in the Upper Hall would have defined a central three-story well of space reminiscent of the hall at Shirley Plantation in Virginia, with its famous "Flying Staircase" (Fig. 6.) Robert Morris lent Washington the large glass lamp that hung in the Hall, which was probably suspended on a long chain from the third-floor ceiling. The staircase continued upward in the same manner from the second floor to the public business office on the third. Fig. 6. This composite photograph of the staircase from Shirley Plantation (Charles City County, VA) superimposed on the arcade from Widehall (Chestertown, MD, Fig. 5) gives a good idea of the stair hall in the Philadelphia house. This is where a delegation of Chickasaw chiefs smoked a pipe with Washington and a young John Qunicy Adams. One approached the house's front door by climbing a wide stoop of three white stone (reportedly marble) steps, tapering in size. The door probably had lights or windows above it, possibly the fanlight reportedly removed from the house by Nathaniel Burt in 1832, and mentioned by his great-grandson.74 A knob to the side rang the doorbell. The inside of the front door had an iron lock and several iron bolts (these were donated to HSP by the Burt family in the 1950s). Stepping up another step and over the threshhold, one entered the passage which was almost fifty feet in length and carpeted in green, probably bisected by an arch resting on pilasters like the entrances of the Powel House and Widehall. At the far end of the passage was the door to the paved yard, which also may have had windows above it. 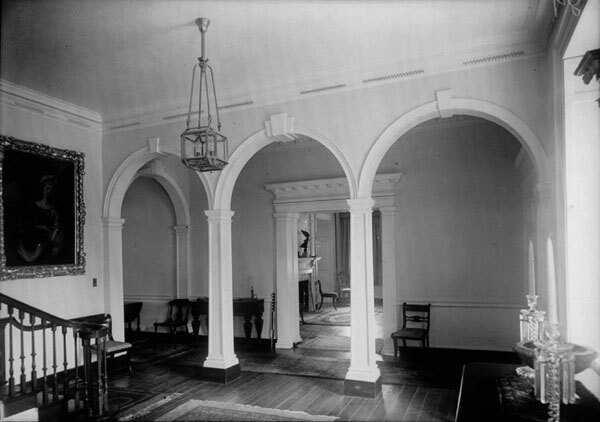 The passage had painted wainscoting to a pedestal height, and the walls above it were probably painted until Washington had the passage papered in October 1796.75 There were three mahogany doors with pedimented doorways, one near and on the right leading into the family dining room; the other two on either side of the far half of the passage leading into the steward's room on the left, and the State Dining Room on the right. The 1773 insurance survey lists a fourth pediment, that probably was over the interior of the rear door. The passage had a modillion cornice. Like Widehall, on the left would have been an arcade of three arches, these resting on two pilasters and two fluted columns. The green carpeting of the passage continued into the hall and up the stairs. An ornate heating stove (also lent by Morris) would have been in the northeast corner. The hall was lighted by a single tall, mahogany window on the north wall, decorated with blue damask curtains. The painted wainscoting continued around the hall until the stairs, where it met the mahogany wainscoting of the staircase. At the bottom of the staircase was a "twist" — the mahogany railing and balusters ending in a spiral instead of a newel post. The ends of each step were decorated with an ornamental scroll, or bracket. The railing and wainscoting of the staircase were "ramped," meaning they curved upward to meet those of the landing. The "house clock," probably a grandfather's clock, stood on the first-floor landing and would have been visible throughout both the Hall and Upper Hall. The family dining room at the front of the house was about 24 x 21 feet, with wood paneling from floor to ceiling all around, including twelve pilasters, and a chimneybreast on the west wall with a mantel and tabernacle frame above it. There were pedimented doorways on the east and south walls, and, on the north wall, two tall mahogany windows decorated with blue damask curtains. According to the 1773 insurance survey, the room had a third pediment (which must have crowned the tabernacle frame), with a cornice above it decorated with fretwork. This probably was the most ornate room in the house that Mary Masters built, and it may have had a ceiling of decorative plasterwork.77 Washington's "blue furniture" from New York was placed in this room, which included a set of dining chairs (probably those now in the HSP collection at the Atwater Kent Museum), and perhaps a pair of upholstered benches. A pier-glass mirror (lent by Morris, possibly the one now on display at the White House), may have hung between the windows. A breakfast table (possibly the one at Mount Vernon) was used for all the family's meals but the formal dinners.78 It was in this room that Washington's guests waited on Tuesday afternoons for his three o'clock levees, or formal audiences, to begin. An "unfolding door," perhaps a pair of narrow French doors, separated the family dining room and the State Dining Room. The guests on levee day would pass through the doorway and see Washington — looking much as he does in Gilbert Stuart's Lansdowne portraits — standing some 30 feet away in the bow at the south end of the State dining room framed by three tall windows decorated with crimson damask. With the sun behind him, the effect must have been striking. According to the 1773 insurance survey, the rear room also had floor-to-ceiling paneling and a chimneybreast with a tabernacle frame but no mantel, a cornice decorated with fretwork, and pediments over the doors to the passage and the front room. The whole ceiling of the State Dining Room was replaced when the bow was added in November 1790, as was the ceiling of the State Drawing Room above it, and no evidence has been found that the new one had ornamental plasterwork. A large carpet with a center medallion of the Great Seal of the United States — made for the State Dining Room by William Peter Sprague of Philadelphia in 1791 — covered the floor.79 This was presumed to have been the carpet in the collection of Mount Vernon since 1897, although recent scholarship suggests that it is not.80 Down the center of the room was a long table — or rather a series of drop-leaf tables which connected to make a single table, with semi-circular end tables, which sat more than thirty. The plateau (now at Mount Vernon), a set of seven low, rectangular, mirrored pedestals (24 x 18 inches and about 3 inches tall) plus two rounded end sections, ran down the middle of the table. Upon this, at State dinners, were displayed a dozen French biscuit-porcelain figurines, along with vases of flowers and candelabra. The furnishings of the room included a pair of "circular" (curved–front) sideboards with large mirrors over them, which probably flanked the chimneybreast. Three large biscuit-porcelain figurine groups, including one called "Apollo Instructing the Shepherds," stood on the sideboards under glass covers. About three dozen dining chairs, probably upholstered in the same crimson damask as the curtains, normally were in the room. These were removed for the weekly levees, and it is likely that the tables were also either removed, or moved to the perimeter of the room with their leaves folded down for ceremonial occasions. "[Washington] devoted one hour every other [sic] Tuesday, from three to four, to these visits. He understood himself to be visited as the President of the United States, and not on his own account. He was not to be seen by any body and every body; but required that every one who came should be introduced by his Secretary, or by some gentleman, whom he himself knew. He lived on the south side of Chestnut Street [sic], just below Sixth. The place of reception was the dining room in the rear, twenty-five or thirty feet [sic] in length, including the bow projecting into the garden. At three o'clock, or at any time within a quarter of an hour afterwards, the visiter was conducted to this dining room, from which all seats had been removed for the time. On entering he saw the manly figure of Washington clad in black velvet; his hair in full dress, powdered and gathered behind in a large silk bag; yellow gloves on his hands holding a cocked hat with a cockade in it, and the edges adorned with a black feather about an inch deep. He wore knee and shoe buckles; and a long sword, with a finely wrought and polished steel blade, and appearing from under the folds behind. The scabbard was white polished leather. This is the most complete description of a levee at the President's House, but its inaccuracies suggest that it may not have been that of an eyewitness. Its author, William Sullivan (1774-1839), was a Boston lawyer whose anonymous newspaper pieces on American history were collected in the book. According to a posthumous biographical sketch by his son in a later edition of the book, Sullivan's (only?) visit to Philadelphia was as a law student in 1795. Even if he may not have attended a presidential levee himself, the level of detail in Sullivan's account leads one to believe that he got his information from people who had actually been there. His major error (besides locating the President's House on Chestnut Street) was placing Washington in front of the fireplace, rather than in front of the windows of the bow.82 Sullivan's account was quoted in the 1844 second edition of Watson's Annals (and all subsequent editions), Griswold's The Republican Court, and dozens of other books. The second story of the main house had essentially the same floor plan as the first (fig. 7). The upper hall and passage contained mahogany windows, and were wainscoted and finished like the story below. These areas provided ample circulation space, plus room for the overflow crowds which sometimes attended the open houses and the evening receptions or "drawingrooms." Fig. 7. Conjectural floorplan of the President's House in Philadelphia — second floor. The President's Room, formerly a bathingroom, served as the private office/study (and problaby Cabinet room) for Washington and Adams. North is toward the bottom. ©2001-2005 Edward Lawler, Jr. All rights reserved. Fig. 8. 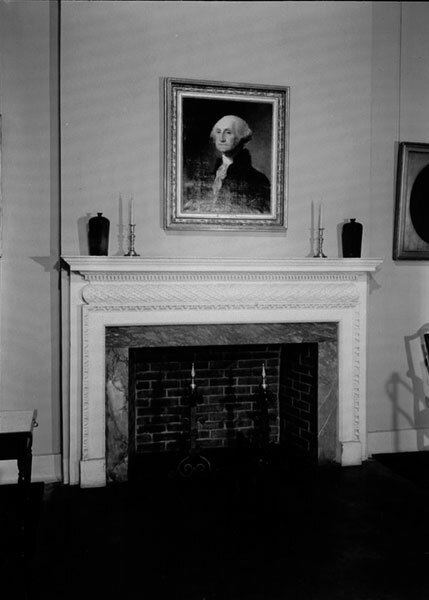 Mantelpiece (ca.1781) from the President's House at the Historical Society of Pennsylvania. It is currently on loan to Mount Vernon. Photo by Jack E. Boucher, ca.1965. Historic American Buildings Survey, no. PA-1942. The mantel's pulvinated (pillow-shaped) frieze of banded foliage — in this case oak leaves — was an extremely rare decorative feature in the colonies, probably because of the complexity and expense of the carving. Not many more than a dozen eighteenth-century examples of this decoration are extant in America. Before the Revolution, the feature is most often associated with the virtuoso carving work of William Buckland (1734-1774), in and near Annapolis. The intricately-carved mantel may give a clue as to the level of decoration in the yellow drawing room, and, indeed, perhaps that of the whole second floor of the house. If all of the doorways in the public spaces in this story had similar pulvinated friezes of banded foliage, there would have been a total of seven of them. This feature might also have been used in the chimneybreast, or in a mantel in the State Drawing Room. Lear wrote to Washington that there were three sets of yellow damask curtains from the New York house, and suggested that if an additional set were made, the four could serve for all of the second-story windows facing Market Street. The household account books indicate that two additional sets of yellow moreen curtains were purchased,90 which could have freed a set to cover the (presumed) window at the south end of the passage. According to an inventory made by Washington in 1797, a large number of pieces of furniture were upholstered in yellow damask — three sofas, two armchairs, ten sidechairs — and the assumption has been that they were all in the yellow drawing room. (If so, it must have looked like a furniture warehouse.) It is likely that some of this "yellow furniture" would have been spread throughout the Upper Hall and passage. The State Drawing Room would have been the same size and configuration as the State Dining Room below it — 34 feet from the doorway to the center of the bow. The curtains on the windows and the upholstery of the French-styled furniture throughout the room were green. There was a large carpet (also green?) from Berry & Rogers in New York. At the center of the room hung a large eight-armed chandelier. Articles in the Green Drawing Room which will be sold. River with the Shanh — The other at the F[ederal]. City. The third story of the house contained "cross-passages" (probably a hallway going east-west, stairs to the floor above, and back stairs to the floor below), the public business office of the president, and three lodging rooms. (The public business office most likely was the west front room, the largest room on the floor,101 which would have had the same dimensions as the yellow drawing room below it.) Washington had an office staff of three or four secretaries ("the Gentlemen of the family") plus his chief secretary, Tobias Lear, all of whom lodged as well as worked on this floor. Lear and his wife Mary lived in one of the rooms with their son Benjamin, who was born in the house in March 1791. Mrs. Lear was an early victim of the yellow fever epidemic, and died in the house in July 1793. When the son of the Marquis de Lafayette came to live with the Washingtons in April 1796, he probably lodged in one of these rooms. The attic or garret was even more crowded, with a dozen or more servants living in it. At Lear's suggestion, the two larger chambers (probably those facing the street) were divided to create a pair of additional lodging rooms, making a total of six on the floor. If the initial room assignments were as Lear and Washington anticipated, one room would have been for the steward and his wife (south side), two for the white male servants (one on the south side, one on the north), one for the white female servants not housed over the wash house (north side), one for Mrs. Lear's maid (north side), and the last for the three male enslaved Africans not housed in the addition to the smokehouse (north side). The original four rooms in this story had been lighted by dormer windows — two facing north and two facing south. The eastern and western walls of the house do not seem to have had windows in their first three stories, but, if there were the usual windows in the gables facing the side yards, each of the six servant rooms could have had a window. It is not surprising that there is much less known about the backbuildings than the main house, since these were spaces normally not visited by the public. The 1773 insurance survey, the 1785 groundplan, and the 1798 insurance policies generally agree on the dimensions of the individual rooms, but, with the exception of Abigail Adams's description of the second story of the bath house, little documentation has been found on the number and location of the windows and doors. To the east of the piazza was the first story of the bath house, which consisted of a bathingroom and (almost certainly) a hallway. It is likely that the bathingroom was in use during Washington's tenancy (otherwise it would have been an obvious place to house servants, and neither he nor Lear suggests this). In Burt II's 1875 address, he quotes a March 1795 contract between Robert Morris and Andrew Kennedy (the new owner of the property) listing the items in the house of which Morris retained ownership. Included in this were "the marble and wooden baths, with the copper boiler, apparatus of the bath etc. "104 — items which may have been used or stored in the bathingroom below the President's study. Among the things that Washington took back to Mount Vernon in 1797 was "one Tin shower bath,"105 but it is not known if this was in use in Philadelphia. To the south of the piazza was the kitchen ell which was 20 x 55 feet (exterior dimensions), and consisted of a large kitchen, about 18 x 36 feet (interior dimensions), and a washhouse or laundry, about 18 x 16 feet (interior dimensions), behind it. The ovens and cooking facilities must have been extensive, since there was generally formal entertaining several times a week, including State dinners on Thursday afternoons at four o'clock, often with thirty or more guests. Sometime after 1773, a second story was added to the kitchen ell (most likely by Robert Morris in 1781-82). Two bedrooms (probably the Morrises' own bedroom and a nursery) were carved out of the space above the kitchen. Sheltered from the street, with the walled garden on one side and the paved yard on the other, these rooms must have been both comfortable and quiet. If equal in size, each room would have been about 18 feet square. Washington and his wife raised two of her grandchildren, Nelly and George Washington Parke Custis, who were eleven and nine in 1790 when the family moved to Philadelphia. The president took one room (most likely the rear one) over the kitchen for himself and Mrs. Washington, and had the other divided into two bedrooms for the children. His plan was that the two female enslaved Africans in the household would sleep in these rooms with the children. The laundresses (and probably the kitchen maids) were to sleep in the room over the washhouse. Some of the furniture preserved in the Washingtons' bedroom at Mount Vernon was used by them in the bedroom in Philadelphia. The famous bed in which Washington later died was in this room. The writing desk from the Comte de Moustier, a dressing table mirror, and an easy chair also may have been here. In addition to building the servants' hall, Washington made several changes to the backbuildings before moving into the house. The smokehouse adjoining the south wall of the wash house was to be converted into a lodging room, probably for the white coachman. A second room was ordered built between the smokehouse and the cow house for the three male enslaved Africans who worked in the stable. The President brought fourteen horses to Philadelphia from Mount Vernon. Ten of these were accommodated in the brick stable and (wooden?) stable, the cow house was converted into two additional stalls, and the last pair of horses were boarded with Hiltzheimer (the diarist), who ran a livery stable a block away. The second part of this article will chronicle the misinformation about the size, location and physical appearance of the President's House, and how confusion over the building led to the demolition of its remaining walls in the mid-twentieth century. The cover of this magazine shows a conjectural elevation of the house. The evidence upon which it is based will be presented, along with an estimate of how much of the buildings may remain under Independence Mall.